Member Stephen L (Clare SA) has put together a very extensive report on his August 2018 trip to Cape York. Stephen is well known for doing a lot of background research before doing a trip and for searching out significant places of either historical or environmental interest and for sharing his knowledge on such matters in his blogs so you're sure to find this a very informative read. Enjoy the read here. Trending posts & highlights - Tyre Monitors, Permit APY Lands, What would you have done, ExplorOz Member awarded OAM, Lithium Battery, should I get one?, I don't understand GVM upgrades, How's your internet slang/acronyms?, Ice or Engel, Everybodies Business, Crusader vs New Age, Car & Caravan Insurance - Premium Creep, Camper Trailer across the Simpson, New Waikerie Silo Art, Quarantine South Australia - Changes to regulations, Corrugations, Multi-meter Settings, Portable Compressor. The ExplorOz Places database currently holds 99,581 POIs. Don't be fooled by other apps that claim to have the largest and most up-to-date This data is fully accessible offline via our app ExplorOz Traveller, or free via your webbrowser. Adventure Offroad Camper Arkaroola, 2018 Jayco Swan OB, Adventure Camper Pilbara, Quintrex Cruiseabout. (Only Premium Listings featured - many more to see online). ExplorOz Beanie and ExplorOz Cap just $15. Further discount for Members applied in shopping cart. We are looking at getting wheel covers back in soon too - stay tuned for details. The Raffle launched for the 2018 National Gathering has now been drawn. Many thanks to the efforts of organising Member - Sir Kev, the contributing artists Member John T, and Jan's Country Art, and to all ExplorOz users that purchased tickets to support this worthwhile charity. A total of $943.50 was raised for our charity Drought Angels. Hand painted metal jerry can depicting the winner images from the 2018 Members' Photo Comp, won by A Selley (ticket D64 Red). 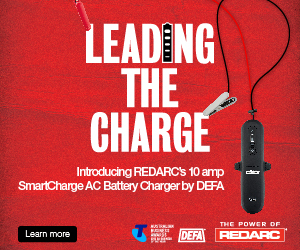 Both John and Geoff each receive a Redarc 10amp SmartCharge AC Battery Charger from DEFA which provides safe and effective charging of larger 12v batteries in cars, caravans, camper trailers and boats. Valued at $275 this continues to be the Redarc Power Prize for the current competition period effective Jan - March 2019. A new version of our GPS Navigation & Mapping app has just been released in the app stores. V3.6.0 is available for Android, iPad, iPhone, and Windows 10. This update introduces new features requested via app users feedback as well as a range of smaller planned tweaks and updates. See this Forum Thread posted yesterday for details of what's new. For more information about the maps, you might like to read this Forum Thread , and this Article: Comparison of Offline Maps & GPS Navigation Apps. If you need assistance, please use the Live Chat on the website, send an email, or call the number listed on the website to reach our office Monday to Friday between 9-3pm (WST).